Power Ranger Online Message Board - Can we expect more ToQger elements in Ninja Steel? You are probably looking at that title and thinking; ”No.” and perhaps "We never got Go-Busters elements in Dino Charge so nah" But hear me out, I’ve got a theory on what I think might happen in Ninja Steel. Lots of pictures incoming! So we all know the deal; Saban buys a show and adapts it into a season of Power Rangers. When Saban buys a show it’s a package deal; Toei gives them the footage, all of the suits (ranger and monster), as well as props. I posted something like this the other day, but today I finally decided to analyze this deeper and more thoroughly. Before I get into Ninja Steel, i’ll go through Power Rangers’ past. Let’s look at Mighty Morphin season 1. They had Zyuranger stuff. Mighty Morphin season 3, Kakuranger footage was introduced as well as monsters. Kaku suits were used but not for the main team. The Shark Machines were used, known as the Shark Cycles. Now kitbashing is another topic. Reusing suits is nothing new to Power Rangers. As I mentioned before, once Saban gets access to the Sentai, they get all of the stuff that comes with it. But that doesn't outright mean they have to use the suits as intended. Some suits were used, some were torn apart and frankensteined with fellow suits. Furio originated from Megaranger’s final villain that was not used for In Space, but Lost Galaxy instead as it’s own character. One character from Carranger in particular was a parody of Mazinger Z, and wasn't used in the show most likely due to copyrights. However, the suit appeared in Turbo but repainted and kitbashed with another monster suit. 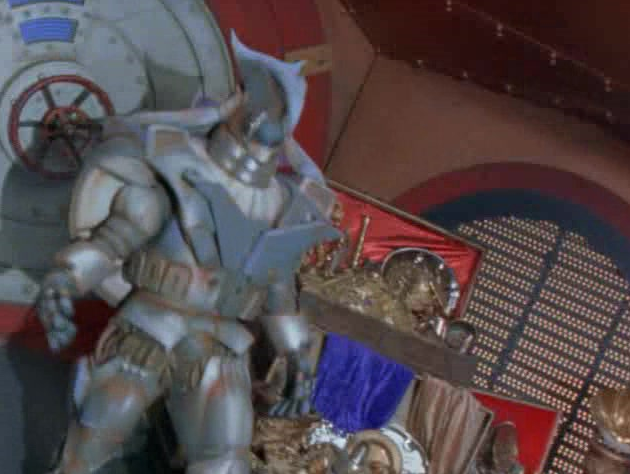 If Saban has access to this unused monster suit, I believe that’s good enough proof that they pretty much get EVERYTHING from the Sentai show they buy from. Here we have Boribaru. 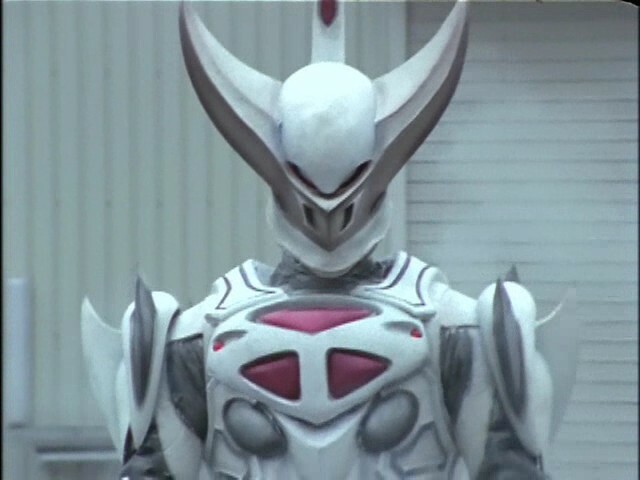 This guy was from Timeranger vs GoGoFive and was not used at all in Time Force. However, his body was used in SPD for a minor character. 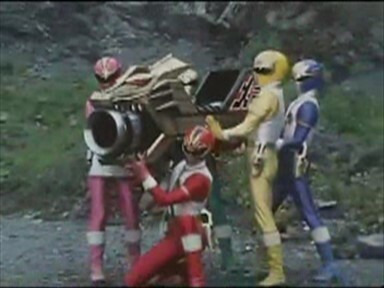 Pierrebori was used in Time for Lightspeed, the Time Force and Lightspeed Rescue team up. Said episode did not use any footage from Sentai. And finally, we have our good friend Snide. Neo Geildon was used in Kyoryuger vs Go-Busters as a villain. I believe that rather than buying the footage of the movie (because at this point, it seems very unlikely that they have), they just bought Neo Geildon’s suit and props. Unless, the suit came along with all the Kyoryuger stuff. Chip saw potential in Neo Geildon, so they decided to use him. His axe was repurposed into a sword, and his shield is gone, possibly to remove ties to Zeltrax? I think that Zaram is the perfect fit for the Gold ranger. You’ve got Galvanax sending down contestants to Earth to challenge the Rangers and steal the Ninja Crystals. When we look at ToQger, Zaram was a Shadow Monster sent to Earth to collect darkness from humans. After realizing the beauty of the world through a rainbow, he left the Shadow Line and helped the ToQgers. Chip can pretty much reuse that storyline for the Gold ranger. In my eyes, that’s one of the twists that Chip loves to do. Using something from ToQger, as well as introducing a new story to Power Rangers (having a monster transform into a Ranger). Then there’s Zed. Back when we first got the synopsis of Ninja Steel, I had faint hope that “Zircon” was going to be Zed. Of course, he ended up being Gengetsu Kibaoni but the usage of Baron Nero opens the possibility that this can happen. I don't think they will use Galvanax in the second half of Ninja Steel. To spice things up, they can use Zed as the new villain. The Rangers can kill of Galvanax, but who will be the new champion of the Galaxy Warriors? A new character can take his spot, much like how Sledge and Heckyl swapped places. Of course, this Ninja Steel talk is all speculation and I could be totally off the mark. It’s also late, so sorry if I repeat several phrases over and over. What do you guys think? Kinda got lost reading that (long day at work & all), but yeah anything's possible (w/in Power Ranger budget anyways). Personally, I'd be content with a short team-up: The 'Rail Strike' Rangers are hunting down a long standing enemy of theirs who just so happens to meet up with the Ninja Steel baddies. The 2 teams decide to work together, take out the villain (whom 'Kibaoni' also decided to betray out of assholeness), and 'Rail Strike' go on their merry way. Not much to it, I admit, but there may not be enough time (and even less money) to do a lot. They could replace all the main villians in Ninninger with the Toqger ones honestly. Even Kyuemon to some degree. He didn't become more active until the second half, so having him as a late addition to the game or even a new threat to the ninja steel that's not Galvanax could work. I want the ToQgers to be a bunch of alien kids Watching the game show, and they are so obsessed with Ninja Steel, they and their dad become their own team of rangers (dad is Rokugou). even if it's only for one episode. Using Zaram for Gold would be awesome. I really want a monster as a ranger. Done right it could be fun. The ToQgers appearing in Ninja Steel is on my wish list for sure.